Sophisticated Owners are always on the alert for the opportunity to profit, whether that means buying or selling. Why is that? Because the whole point of owning real estate is to make money. You wouldn’t run a Doctor’s office for free, or a grocery store. Likewise, investment real estate has to make money to justify all the work you put into it, and sometimes that means buying or selling. Why? Can’t you just hold forever? You can, but two things will happen: 1. Over time you’ll get less leveraged, more of your net worth locked into one location, less depreciation deduction in an older and older building over time, and 2. You’ll miss golden opportunities to increase your wealth along the way. As time goes by, real estate loses value relative to the real estate market as a whole unless you’re lucky, work hard, and in some ways, you just lose regardless. Against this backdrop of decline relative to other opportunities we as owners can make the choice to consider those other opportunities. • In every market, there is a point at which values are high relative to income. This is a point at which to hoard cash, refinance and keep the money, sell and pay taxes if that’s your long term plan, sell and trade into a different part of the country or a different product class such as Net Leased. • In every market, there is the reverse point at which values are low relative to income. Buy. Find a way. • Maybe most important, in every part of every market, that means this can happen right now, anytime, opportunities to sell at a high price or buy at a low price come up. This is much better than timing the market because it’s famously difficult to time markets. Just look for deals and be willing to sell if you get a high offer. The last part requires being in touch with a couple of good brokers. That’s were we come in. Call me for an Estimate of Value on your property. 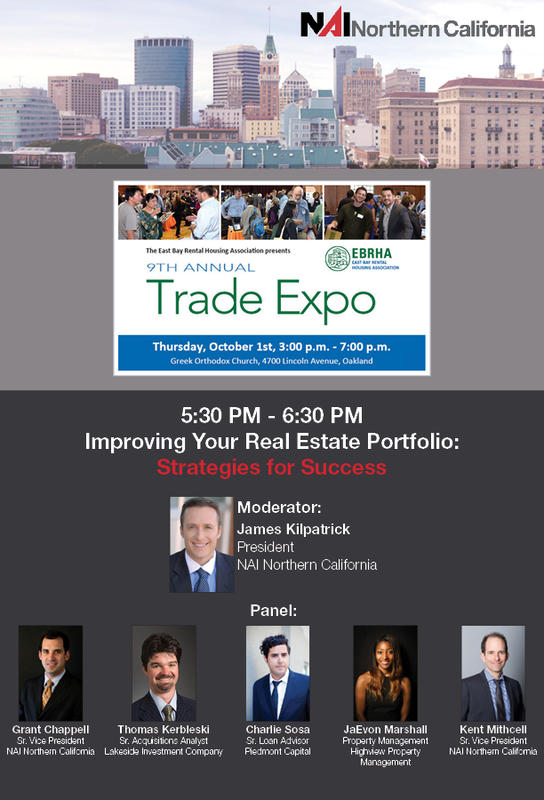 Join me and fellow panelists at the 9th Annual EBRHA Trade Expo today in Oakland, CA. We’ll discuss strategies for improving your real estate portfolio. We’ve been in a strong real estate market for several years and this summer we’re seeing rents and resale prices higher than ever before. The 2007 recession has diminished in our collective rear view mirror. So what is next? An important task property owners should take on now is to observe where their property’s market and sub-market has been recently and where it may be headed. For example, while the Oakland multifamily market has been booming for several years, the Berkeley market near UC campus was moving powerfully ahead even in the depths of the recession. And the Fairfield market is just now hitting the level of rental demand that we saw prior to 2007. At what stage is your market? For example, if you own property in the Fruitvale district of Oakland, you are now seeing simultaneously strengthened rental demand and dramatically increased resale value for a given rent—a powerful combination for an area that has been historically slow to pick up during each recovery cycle! If you sold a $2MM, 6-unit property beside Lake Merritt in Oakland today on which you had a $1MM loan and were receiving an annual cash flow of $45,000, you could purchase the $4MM property I have listed at 307 E Tabor in Fairfield and have a cash flow of well over $100,000 per year. That is more than double the cash flow for a two-part transaction we can facilitate with confidence. You can get from Downtown Oakland to Downtown San Francisco in 11 minutes by BART. If you were a renter looking for a place, would you consider Cole Valley in San Francisco, 35-45 minutes by Muni from downtown? Or would you first take a hard look at Downtown or Uptown Oakland, 11 and 13 minutes from San Francisco by BART? These areas of Oakland are full of daytime and nighttime activities (and job opportunities) and are three times “closer,” in travel time, to Downtown San Francisco than most of San Francisco itself. This is one major reason Oakland is doing well right now. The Kent Mitchell Team has recently closed several Multifamily, Office/Retail and Mixed Use buildings. Call Kent today for an estimate of value: 510-548-2554.
Who doesn’t know Oakland is going through a Renaissance? A year ago Downtown (and Uptown) Oakland was a mixed bag of A to C office uses. It still is, but something has changed in the well-located C office market: assets close to BART are attracting attention from B office users, tech transplants from San Francisco, and developers. And they are attracting B office prices. Call me for details on the 25,000 sq ft building now in contract that fits this model. Three blocks away a 23,000 sq ft building that sold for $2.2m last year is offered now at $3.5. That’s not the end of that sequence, however. That $3.5m building should be tradable above $4.6m to the right buyer if this market holds up. Will it? The Multifamily and Office Markets in San Francisco are so far beyond Oakland in pricing that they are lending not only support but growing momentum to the Oakland market. The Oakland market is entering a consolidation phase in which property values begin to be based upon highest and best use as opposed to current. Current income doesn’t hurt, but the buyer is hot to take the property to the higher use. We have seen this in San Francisco and Peninsula markets for some time. 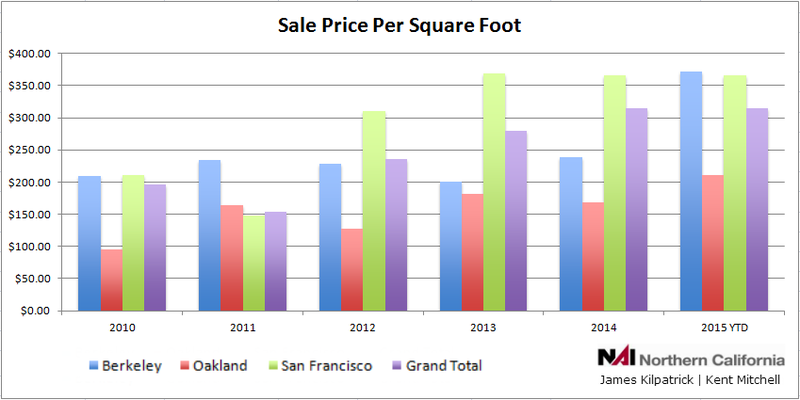 Downtown Oakland is newer to the fold and thus still a richer opportunity for both Buyers and Sellers. The Downtown Oakland office market is changing. Where before we saw vacancies as high as 20-50%, depending upon the specific product and location, now we see compression to below 10%. For office, that represents full occupancy because a 10% or lower vacancy means an owner can choose to rent a space by simply lowering the price incrementally or by offering tenant improvements to draw a tenant way from a competitor. As long as this office rental market is sustained in Oakland it makes a well-located office or office with retail purchase much less risky. That’s important because, while cash flows on multifamily have been under pressure for a long time cash flows from office have not: it remains possible to purchase a well located office building in Oakland with capitalization rate above 6% and cash-on-cash return above 10%. That is no longer possible in the multifamily market. But the key question in relation to cash flow is risk. Call me to discuss Oakland Office opportunities. Current 10-year fixed-rate loan rates allow for long term protection against interest rate changes while still allowing for high cash-on-cash return for properties (such as well-located Oakland office) with cap rates in the 6+ range.